Few sports are as good for your endurance and your heart as cycling. Cycling is very effective at helping you shed pounds, while also improving your stamina. Cycling can also be a great adventure, depending on the terrain you choose. If you want to become a cyclist, then you're going to need a few pieces of equipment, which will depend on how and where you intend to ride. What kind of cycling do you plan on doing? Do you want to go extreme and take to mountain trails, or are you more interested in long-distance cycling over paved roads? Mountain bikes, for example, are built quite differently from 10-speeds because of the added stress the bikes will face during use. 10-speed road bikes, on the other hand, are sleeker and lighter, so they produce less drag and friction when you are trying to reach higher speeds. There are several other equipment elements to consider in your cycling outfit. You'll need a helmet, as they are required by most communities and states. You might also want to consider including other protective gear like pads and gloves, particularly if you plan to traverse rugged, dangerous terrain. Distance cyclists might want to invest in a water bottle and very light cycling clothing to keep their endurance up. For a list of online bike shops and bicycle manufacturers, visit BicycleShop.us. For bicycle components information, visit BicycleParts.us. For bicycle transport solutions, visit BikeRacks.us. 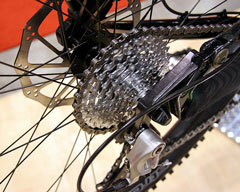 Directory of bicycle parts and supplies makers and distributors in the United States of America. Each directory listing includes contact information, category tags, and a website link. Directory of bicycle manufacturers and distributors in the United States of America. Each directory listing includes contact information, category tags, and a website link.